Every summer before popes go on vacation, they traditionally clear their desks of all pressing issues. Before Pope Benedict XVI left for three weeks in the Italian Alps, he dropped a bombshell of a document that has theologians, scholars, clerics, and laypersons wringing their hands and wrestling with his words. All Christian traditions except Roman Catholicism have “defects,” “wounds,” or are not true churches, according to the controversial document from the Vatican’s Congregation for the Doctrine of the Faith that was personally approved by the Pope before its July 10 release. Some Protestant clerics and Catholic theologians have described the statement as unnecessarily negative, but also one whose terminology has been widely misunderstood outside of academia. “To understand Pope Benedict, you must remember that in his heart he is a German academic,” said the Rev. ThomasReese, a Jesuit priest at Woodstock Theological Center at Georgetown University in Washington. Although the Pope said other Christian traditions “suffer from defects” because they lack these objective elements, he acknowledged that “they still belong to the body of Christ and God is active within their communities,” Mr. Gaillardetz noted. “It is important to note that the recent document repeats and upholds what the Second Vatican Council taught theologically about the nature of the church,” said Bishop Leonard Blair of the Toledo Catholic Diocese, which has 325,000 members in 19 counties. The latest document does not change Vatican II’s assertion that “non-Catholic Christians can experience God’s saving action through the faithful practice of their own Christian faith,” Mr. Gaillardetz said by e-mail from St. Louis, where he is teaching this summer. Bishop Bruce Ough of the West Ohio Conference of the United Methodist Church called it “unfortunate” that information intended for Catholic audiences has made headlines in the mainstream media. He and others pointed out that the document restated long-held Catholic doctrine and contained nothing new. 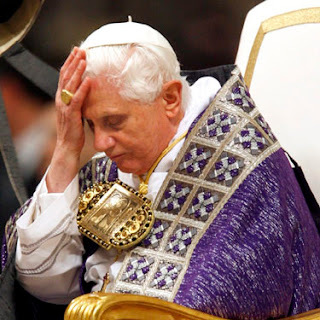 “Pope Benedict has said nothing that has not been said before. These are all well-established viewpoints of the Roman Catholic Church for centuries,” Bishop Ough said. Some Protestant leaders, how-ever, expressed disappointment that the Pope chose to issue such a harsh statement, saying they feel slighted that the leader of the world’s 1.1 billion Catholics believes their tradition does not qualify to be a church, regardless of the statement’s academic nature. “I think it’s unhelpful and tragic in terms of how Jesus looks at his people,” said the Rev. Adam Hamilton, a United Methodist pastor from Kansas City, Mo., and author of Confronting the Controversies: Biblical Perspectives on Tough Issues. He said, however, that he does not think the document will hurt ecumenical relationships among Catholics and Protestants. Mr. Miller pointed out that Bishop Lohrmann and Bishop Blair are joining together to lead a 10-day public tour of religious sites in Europe in October. “That whole trip, I think, is going to do wonders in terms of developing the relationship between the churches even further,” Mr. Miller said. But it also said the Orthodox Church is harmed by the “defect” or “wound” of not recognizing the primacy of the Pope. The Eastern Orthodox and Roman Catholic churches separated nearly 1,000 years ago in the Great Schism of 1054. “Peter was not in any way above the other apostles and that misinterpretation by Rome has been the source of a lot of problems,” Father Paul said. Some church leaders see the latest controversy as a chance to promote their own beliefs.Just as Catholics don’t consider the Southern Baptist Convention to be a church, “evangelicals should be equally candid in asserting that any church defined by the claims of the papacy is no true church,” said the Rev. R. Albert Mohler, Jr., in an online blog. He is president of the Southern Baptist Theological Seminary in Louisville. At least one Protestant leader said the Pope’s choice of words was commendable.